Dutch firm UNStudio has unveiled images of its first UK project: a 30-storey residential tower on London's City Road. Named Canaletto, the tower is designed with a curving facade of metal and glass that breaks the volume into a series of three-to-five-storey clusters. Each of these clusters are imagined as individual "neighbourhoods in the sky", with balcony terraces that afford views of the City of London to the south and the basin waterways to the north. "I often find it difficult that if you look at the history of residential towers, they're so neutral and monolithic in their appearance," UNStudio founder Ben van Berkel told Dezeen, "but that when you walk away from [this] tower you can point to your own apartment and you can say 'well I'm living in the third cluster'. You can play with that identity." Van Berkel also compares the articulation of the facade to the expression of detailing in furniture design. "The elegance is found in a texturing of the facade, giving it more of an unusual scaling," he said. "Maybe it's related to my fascination for furniture design and the idea of how one can extend an interior to its facade." The building will provide 190 apartments, in addition to a health club, a swimming pool, a private cinema, a restaurant and a members' club for residents. It is set to complete in 2015, when the first apartments will go on sale. Architecture firms Foster + Partners and SOM are also working on proposals for residential towers in the area. The developers claim that this is a reaction to the growth of digital businesses in the area: "The emergence of Old Street as a centre for technology and creative industries is driving demand for residential properties with architectural excellence in the surrounding area," said Aref Lahham, founding partner of development group Orion Capital Managers. UNStudio's Ben van Berkel to Dezeen editor-in-chief Marcus Fairs about the project at the tower's launch in London - read the interview here. Amsterdam-based UNStudio are also working on a tower in Singapore with chunks missing from its facade and a pair of towers in Hangzhou, China. See more design by UNStudio. Internationally respected architects UNStudio are bringing their visionary interpretation of how buildings should interact with their environment to a part of London which is at the nexus of some of the capital's most creative and exciting communities. City Road Basin, on the northern periphery of the City, adjoins London's trendiest and most creative districts; Hoxton, Clerkenwell and Shoreditch, as well as leafy residential Islington and the emerging high tech cluster around the Old Street area. Part of a major redevelopment of London's Regent's Canal, City Road Basin is becoming one of the most vibrant new London residential hotspots. The jewel in the crown here is Canaletto, a new 30-storey tower by the celebrated Dutch architecture firm. Canaletto offers 190 apartments, ranging from studios to a large penthouse. The development's superb views, restaurant, health club, swimming pool, private cinema and residents' club on the 24th floor, with an expansive terrace, will make Canaletto a social hub at the centre of an exciting neighbourhood. Canaletto's innovative design defines a new aesthetic for residential high-rises in London and will make the building a landmark in its own right. The architects have created a multi-faceted façade giving a pleasing appearance from all aspects. The building is broken into multiple 'neighbourhoods in the sky', accentuated through organic shapes conveying a sense of scale and intimacy unprecedented for a building of this height. Careful detailing and fluid transitions between interior and exterior spaces further add to the exceptional quality of living Canaletto will offer. "The City Road Basin area is in a unique position, in close proximity to the City yet redefining itself as an up-and-coming residential borough. As such, our design for the Canaletto tower required a distinctly contextual response; one which acknowledges the need for an explicitly residential identity." "Near and distant townscape views are enhanced through scale, detail, and material variation which gives the building a soft, nuanced silhouette. The tower's façade groups sets of three to five adjacent floors together to create a series of 'neighbourhoods in the sky'. Contrasting materials are employed within each grouping, where the 'outer' metallic element is complemented by an 'inner' use of textured materials. Throughout the building, the cluster concept of the facade is designed to maximise levels of transparency and frame the views towards the sky." "The materiality of the facade is drawn from examples of detailing and the contrasting of materials expressed in product or furniture design. The modelling of the balconies within each grouped cluster lends variability to the facade and the living experience for the residents in the building." "Outdoor spaces play a large role in the enjoyment of living environments. Therefore the attention to creating unique, sheltered spaces of high quality was a driver in early design development." "The aspect of using a both textured and smooth materials contrasts with the typical high-rise glass and metal construction and lends this facade a contemporary residential 'twist'." "The elevation also offers sustainability benefits. The surface modelling creates opportunities for shading, balancing good internal daylight and views with reduced heat gains. The articulation of the façade will additionally reduce wind down drafts and, in combination with canopy proposals at the base of the building, provide an improved pedestrian microclimate." "A landscaped garden on Wharf Road provides access to the residential lobby, whilst the ground floor garden provides an attractive entrance and a green oasis off the busy City Road." "The emergence of Old Street as a centre for technology and creative industries is driving demand for residential properties with architectural excellence in the surrounding area, and living waterside, alongside the canal, is an added benefit for many prospective buyers." "UNStudio's exciting design for Canaletto highlights the arrival of City Road Basin as an increasingly prime residential area – convenient not only for the City but also Islington, Clerkenwell and Hoxton." "We are seeing increasingly strong demand for good quality product in zone 1 and 2 London locations. Purchasers want to make logical investment decisions ensuring they are placing their capital in a market where they will get the best returns for their money and London remains the number one destination for safe haven assets. Canaletto ticks all the boxes. 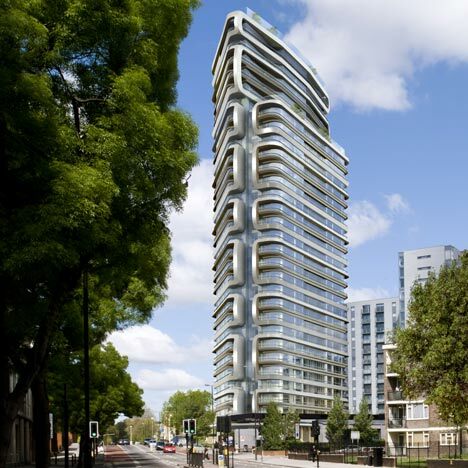 This 30-storey tower designed by renowned architects UNStudio comprises 190 apartments and is located on the fringe of the City, next to some of London's trendiest areas. Developed to the highest spec, offering number of features including a 24th floor residents sky bar, swimming pool, gymnasium and cinema room with top of the range amenities, Canaletto will offer exceptional living in the heart of London." First completions at Canaletto are scheduled for 2015 with prices starting from £390,000.